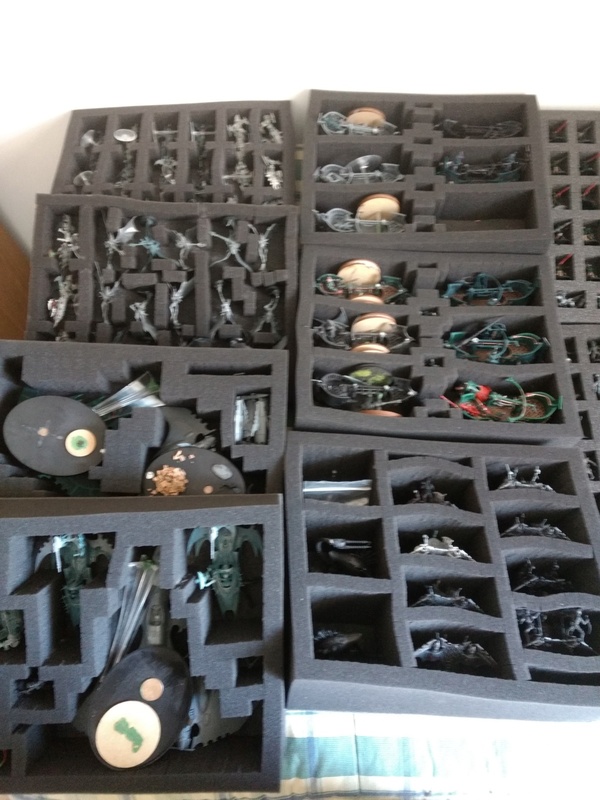 So I'm gonna be moving house in a few months and I have to think about the best way to store and transport my Drukhari models. I am considering getting one of the larger GW carry cases but I am concerned that due to the multiple flyer bases and the many many spikey/pointy parts on the models that it simply won't give the space I need to store/transport the majority of my models. In the GW demos they show unpacking an SM and imperial army from their cases, but those model ranges are quite compact, unlike us Drukhari. The profile of a rihno and a raider don't really come close. I've been collecting DE/Drukhari since 3rd ed and while I won't have as much stuff as some I do have quite a lot of it (probably ~200 models). I have also looked at custom foam trays and cases but that option gets very expensive very quickly. So really I'm just asking for some tips and advice from folks who have experience with GW cases. Are their largest cases suitable? Do they hold enough? Is there a better option? Or indeed the opinion of anyone who has had a similar problem but solved it! 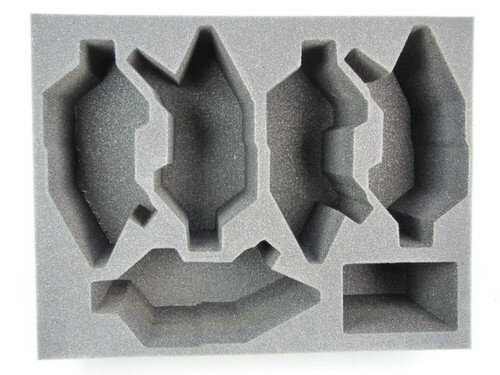 You could buy some bespoke foam cutouts for your models. I have quite a few raider and venom shaped holes in my foam casing to be carried in KR multi-cases. Then again, I never use them, as I tend to wrap up my venoms and raiders in bubble wrap and put them in bubble-wrap bags. They always work, just not sure for long distances for long periods of time. I dunno if there IS a good way to transport Dark Eldar. I've been playing them since 5th....and I tried foam, but more pieces broke off in the foam than if they were just stuffed in a box. and with the foam, its always the pointy bits that break... in a box, generally they break arms at glue spots and such. The only problem with box carrying is that if you have to slam on your breaks or (as happened to me) a dog trips you while you are walking through the door... MODELS EVERYWHERE! By foam do you mean GW pressure style foam? The battle foam style cut outs should be quite safe. Foam varies quite a lot - I use high/medium density upholstery foam as a handmade solution and it's given me no issues. I wish there was a way for me to test out a GW case to see if it was feasible to buy for transporting my drukhari splinter. Maybe if i ask really nice in my (somewhat) local GW store they will demo putting some drukhari in it for me. I can't say I would be willing for to fork out for the cut to shape foam trays as I would need fair number of them. It is probably the best option for secure transport and storage though. A friend of mine said he had read about tourney players putting small magnets on their model's bases and carrying them on sheet of metal. I guess this would also work if you put a box over the sheet of metal, but it's a terrible amount of effort for me to go to. So I passed on this particular idea. I'm starting to think carefully bubble wraping is the way to go. Then putting the bubble wrapped stuff into a container that allows for no movement on the inside. I guess I only need access to around 2k points of the models anyway, so most of them can remain in storage. My lists won't change much either untill they adjust Drukhari's balance. I picked up a cheap toolbox (I'm in the UK, a 24 inch Stanley ran me about £20). The foam cost me £10 from Ebay so altogether it wasn't hugely expensive - just took a little time to cut and glue the foam into appropriate shapes. If I did it again, the only change I'd make would be to get some kind of supporting structure for the edges of the foam like thin wire to give it a bit more stability when out of the box. Battlefoam custom DE trays are great for the vehicles, not so great for the troops. I would recommend buying a couple vehicle trays and put them in a moving box or a document box. That would be the safest and cheapest way in my opinion. I use a christmas ornament box, line the bottom with a thin layer of foam, and just lay the models down in it. 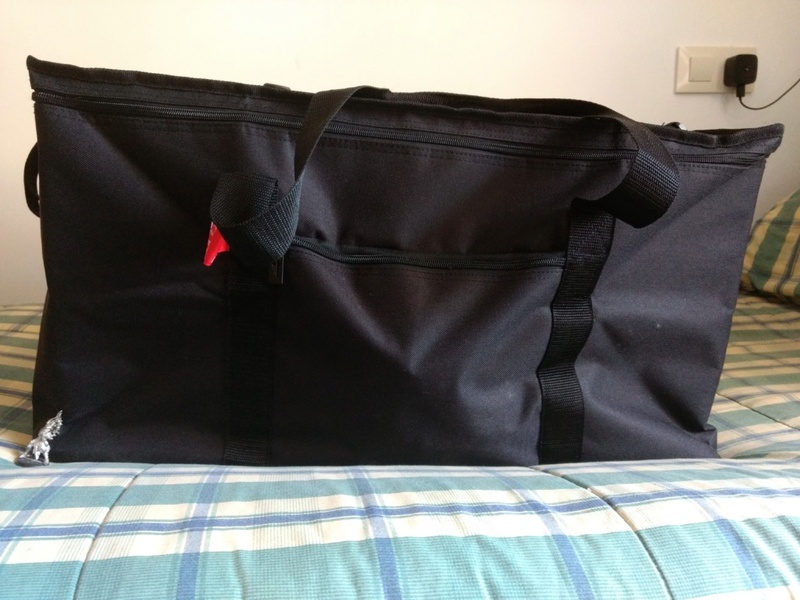 I generally pack them tight enough that they don't rustle around too much, and even if they do, any damage is minimal. It's far from an optimal solution. The one I like the most is magnets and magnetic trays, especially the ones with metal tray racks that roll around with armies deployed on them. Very convenient for tournaments. Largely this is a how to transport Raiders, Venoms and flyers issue. Our infantry, while a bit spiky goes fine in the standard cases. Pain engines and bikes are a little trickier but not too hard to deal with. I found old style Raiders weren't too bad to transport. I got a cheap small case (about $15), got some upholstery foam cut to fit the case (about $5) and it compresses the tail well enough to hold the Raiders. They even survived airport baggage handling without breakages. The newer vehicles I haven't found a good solution for yet, and maybe just need to go with the type of option Withershadow is showing. I also have battlefoam. Can confirm the vehicle stuff is perfect. The troop foam that is specific to DE isn’t so great though. The troop cut outs are like a few mm off so they don’t fit so well. They also sell cardboard boxes that the foam fits into. Those are far cheaper than getting a normal bag. I have a bunch of those stacked in my closet. Yep they kind of snagged that idea from KR multi-case, who are also a good option. Less expensive and more transport options (backpacks, briefcases, traditional bags, etc.). I use the magnet option. Have glued some thin metal sheets to the bottom of plastic box tall enough to accommodate raiders on there stands. A small magnet in the base is enough to hold them firmly, as well as my venoms and starweavers. For reavers the stick on sheet magnet (like fridge magnets) are good enough to hold them in place as well. I used to use a magnetic storage case, then I had to skid to a stop down from like 80mph due to a pile-up on the highway, and they all got tossed into the side of the case and shattered to pieces (they were metal models). Plastic should hold up better, but I'm still traumatized. I would be tempted to line the metal sheets with foam, with cutouts for the bases, just to keep them in place. Also maybe you want to buy a ruler or measuring sticks for you and your opponent to use, because I've seen more than once a tape measure get drawn in by the magnets and scuff up the paintjobs. If you go the magnet route, couldn't you just use a metal toolbox for a similar benefit to the expensive version? I had a metal tool box and the impact was not kind. Most of the bags I see now are light aluminum frames surrounded by heavy canvas material, so the models should just bounce and re-attach to the trays (as opposed to whatever surface they struck). The boxes and bag here are what I use. You can also use the carton boxes alone, which is a little cheaper. The cluster foam works good for larger models like raiders. Although I did not manage to get more than 2 voidravens/jetfighters in one box because of their formfactor. I use stackable small plastic boxes with a section of pluck foam in them. Great to store all my vehicles and talos/cronos. Need to find a carry case for them though to make things easier. I use an old school GW hard case for my infantry which works well enough. I had the same problem a few weeks ago. 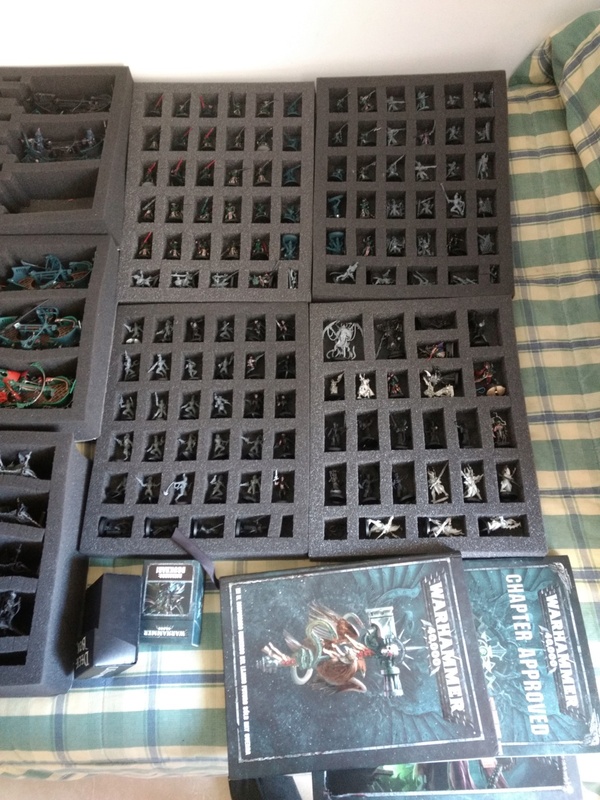 I wanted something to storage and transport my complete army. In the end, that was imposible and my final decision was bought a Feldherr Transporter and pick and pluck foam. Those are some photos with the transporter and my foams. I hope they could help you to have a reference of it capacity. I bought the transporter without any sotrage box, I will wait until the release of the XXL box to buy it and buy the restant foams that i need to the rest of my army. I cut the bottoms off egg cartons and put them in a dollar store tool box. It fits 2 side by side with snug space for a raider. Custom cut a second layer to accommodate scourges, jetbikes and venoms. Holds 20 infantry and a raider on the bottom layer, 6 jetbikes 5 scourges and 2 venoms along with my characters and guys with special weapons. I also have a couple ammo boxes with egg carton bottoms for storage. Its not perfect. Never broke a model in transit, but never dropped it. Everything is snug enough, and it was DAMN cheap. The egg cartons accomodate all but my succubus and shardnet impaler wyches perfectly fine.